How would you describe Marina Singh? How has the past shaped her character? Discuss the anxieties that are manifested in her dreams. “Marina was from Minnesota. No one ever believed that. At the point when she could have taken a job anywhere she came back because she loved it here. This landscape was the one she understood, all prairie and sky.” What does this description say about the character? Talk about Marina’s relationship with her boss, Mr. Fox. Would you call what they share love? Do they have a future? Why does he want Marina to go to the Amazon? What propels her to agree? What drew Marina to her old mentor, Annik Swenson? Compare and contrast the two women. How does Annick see Marina? Barbara Bovender, one of Annik’s caretakers/gatekeepers tells Marina, “She’s such a force of nature. . . . a woman completely fearless, someone who sees the world without limitations.” Is this a fair assessment of Annik? How would you describe her? How has the elderly doctor’s past shaped the person she is and the choices she has made? Describe the arc of Marina and Annik’s relationship from the novel’s beginning to its end. Do you like these women? Did your opinion of them change as the story unfolded? Why didn’t Marina ever tell anyone the full story of her early experience with Annick? Consider Annik’s research in the Amazon. Should women of any age be able to have children? What are the benefits and the downsides? Why does this ability seem to work in the Lakashi culture? What impact does this research ultimately have on Marina? Whether you are a man or woman, would you want to have a child in your fifties or sixties? How far should modern science go to “improve” on nature? In talking about her experiences with the indigenous people, Annik explains, “the question is whether or not you choose to disturb the world around you; or if you choose to go on as if you had never arrived. “ How does Marina respond to this? Did Annik practice what she preached? How do these women’s early choices impact later events and decisions? How does Annik’s statement extend beyond the Amazon to the wider world? Would you rather make a “disturbance” in life, or go along quietly? Talk about the Lakashi people and the researchers. How do they get along? Though the scientists try not to interfere with the natives’ way of life, how does their being there impact the Lakashi? What influence do the Lakashi have on the scientists? Would you be able to live in the jungle as the researchers and natives do? Is there an appeal to going back to nature; from being removed from the western constraints of time and our modern technological society? What role does nature and the natural world—the jungle, the Amazon River—play in Marina’s story? How does the environment influence the characters—Marina, Annik, Milton, Anders, Easter, and the others? Annik warns Marina, “It’s difficult to trust yourself in the jungle. Some people gain their bearings over time but for others that adjustment never comes.” Did Marina ultimately “gain her bearings”? Marina travels into hell, into her own Conradian “heart of darkness.” What keeps her in the jungle longer than she’d ever thought she’d stay? How does this journey transform her and her view of herself and the world? Will she ever return—and does she need to? What is your opinion of the choices Marina made regarding Easter? What role did the boy play in the story? Do you think Marina will ever have the child—one like Easter—that she wants? What do you think happens to Marina after she returns home? State of Wonder is rich in symbolism. Identify a few—for example, Eden Prairie (Marina’s Minnesota home), Easter (the young deaf native boy), Milton (the Brazilian guide)—and talk about how Ann Patchett uses them to deepen the story. 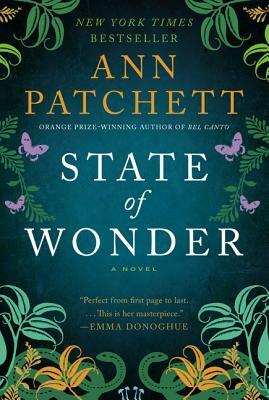 State of Wonder raises questions of morality and principle, civilization, culture, love, and science. Choose a few events from the book to explore some of these themes. What is the significance of the novel’s title, State of Wonder?